Last summer, after I dug up all the potatoes in my first patch ever, I cooked some and set some aside. 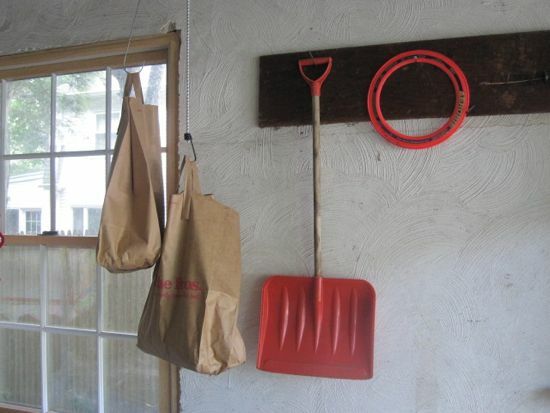 I also hung brown grocery bags of potatoes by bungee cords from the overhead door track in the garage. I didn’t want to hang them in the cellar, fearing a rodent attack. So, a ‘root garage’ would have to do. Over the fall and winter, we ate some potatoes. The garage is unheated, and yet they didn’t freeze. Feeling very much like Caroline Ingalls, a hero of mine, I left quite a few in the bags uneaten, as seeds for a future patch. Well, this spring I did not do potatoes. I wanted a break from caring for so many living things to tend to other interesting challenges (writing, skating) as well as to children and students, who cannot wait. I suppose Caroline Ingalls, more legitimately concerned with survival than I am, would never have taken a break from kitchen gardening — it would have short-changed the family’s diet profoundly. Recently I commenced the annual summer ritual: the garage clean-out. (Why doesn’t the garage stay cleaned out? We haven’t accumulated any new garage stuff.) The bags hung there, still dry, and no rotting potato juice stained the bottoms. It had been months since I looked in. I imagined a bag full of potato raisins: dried, shrunken, and tough nuggets. 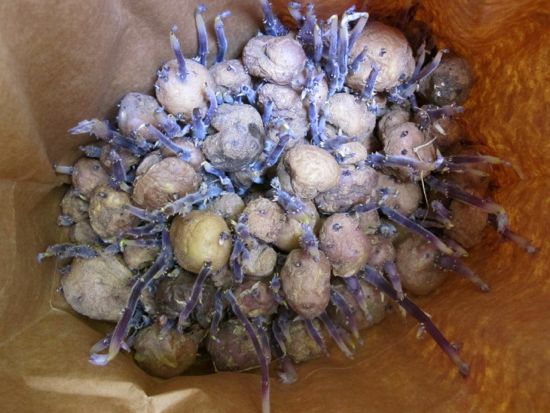 What I found: intact purple seed potatoes, sprouted, reaching their arms up to me, begging to be planted. Did I plant them? If I were Caroline Ingalls, I would have. But I’m not her, and I didn’t. Off to the compost they went. Their bountiful energy will go into some other growing thing.